Hope you can join us for the new challenge starting today at Paper Creator. The theme is Just For Men. You are not required to use products from Paper Creator, but you will get an extra entry if you do. The prize is a gift certificate to the store. If you would like to place an order, Please enter code DELORIS to save 20% off your order. I created this card using a darling precolored image called Handsome Max. I used Gimp to make the diamond and dot papers, then saved them as patterns in Silhouette Studio. Cut out all the pieces using my Silhouette Cameo and cut file #63383 by Lori Whitlock. A fabulous card Deloris, such a sweet image and fabulous colours. Love this happy orange, and the blue looks great with it, Deloris! Wonderful design - thanks for sharing it with us at the Simon Says Stamp Wednesday challenge! 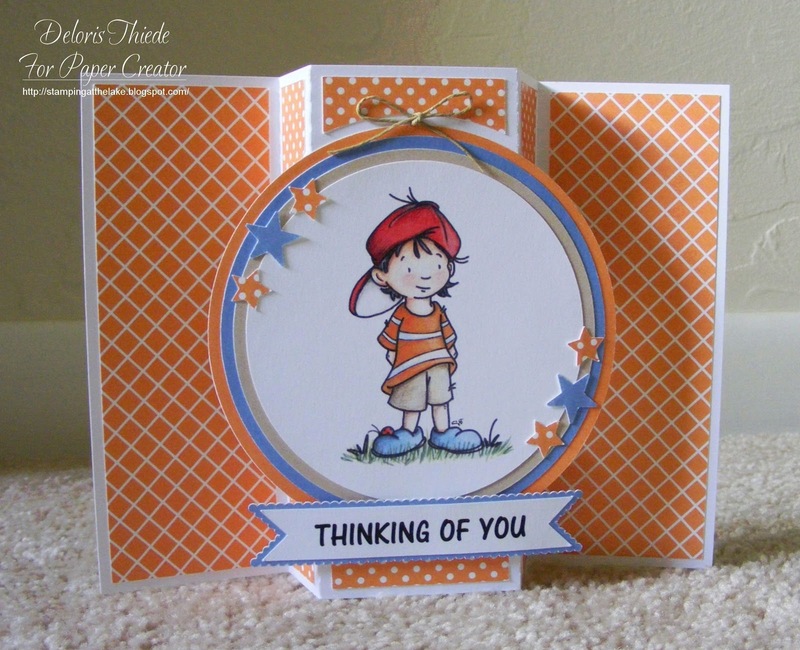 Deloris, what an adorable little boy, and I love the great card fold with this sweet DP and color combination. Sweetness! Hugs! First of all, the colors are amazing on this card! Orange is one of my favorites. I'm totally impressed that you designed your own paper! Adorable image, perfectly placed stars, and really cool design. Fantastic card! Beautiful card, love the percolated image and your design.